Croxley Ales -- which typically serves up dirt cheap wings -- is running an even more amazing special that ends this week: 10 cent wings on Monday, Tuesday, and Wednesday night. So many nights to choose from! 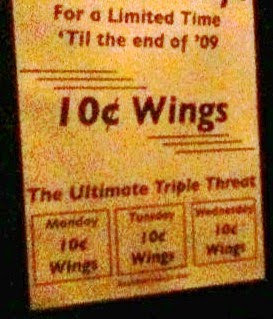 They're deeming this promotion "The Ultimate Triple Threat" and to fully take advantage, I think you should go all three nights! But for starters, you can check out the Vikings Vs. Bears tonight in the final Monday Night Football game of the season.